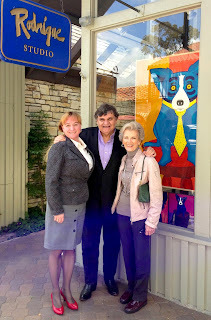 In 1991 George Rodrigue opened Galerie Blue Dog in Carmel-by-the-Sea, California. The one-square-mile village includes cottages, restaurants, shops and galleries, all descending westward towards the beach and Pacific Ocean. 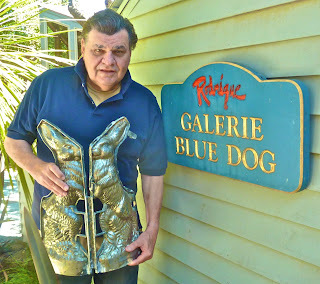 In Rodrigue’s Louisiana style, the gallery opened with the help of his good friend, Chef Paul Prudhomme, who fed hundreds, or maybe thousands, of eager Californians during a party so popular that lines wrapped around our block. We received reservation requests for months afterwards, as folks confused the arrival of a Cajun artist with the arrival of jambalaya and étouffée. We threw costume parties at Mardi Gras and Halloween, with George and his boys dressed as the Blues Brothers, while Sandra (see below) and I dressed as colorful cats. In addition to Hansel-and-Gretel-type cottages and narrow, tree-lined streets, part of Carmel’s charm is its timelessness, including a lack of addresses. In 1991, having never seen the West Coast, I transferred from the Rodrigue Gallery of New Orleans and lived for six years in a tiny house on the east side of Guadalupe Street between 4th and 5th Avenues. Without need of a car, I walked daily the ten blocks to Galerie Blue Dog, stopping along the way to visit with friends, detouring between the coffee shop, market, and beach. 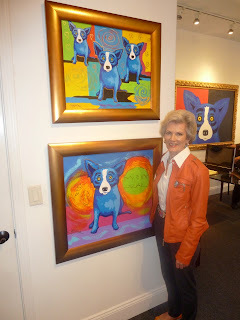 The original Galerie Blue Dog opened in 1991 on the South side of 6th Avenue between Lincoln and Dolores Streets. A former doctor’s office, the space was long and narrow, with one small window. At the time, it was the only option available in the popular tourist’s destination. One block from the main drag of Ocean Avenue, the odd space fit us well for many years, as we joined the artist-owned galleries and family businesses that cemented Carmel’s charm. I described our side of the street as “Flowers, Fruit, Dogs, Ducks and Fairies,” featuring Lilliana Braico’s pink blossoms, Loran Speck’s Renaissance-style still-lifes, George Rodrigue’s contemporary Blue Dogs, The Decoy’s hand-carved wooden ducks, and Lynn Lupetti’s dainty creatures and fairies. 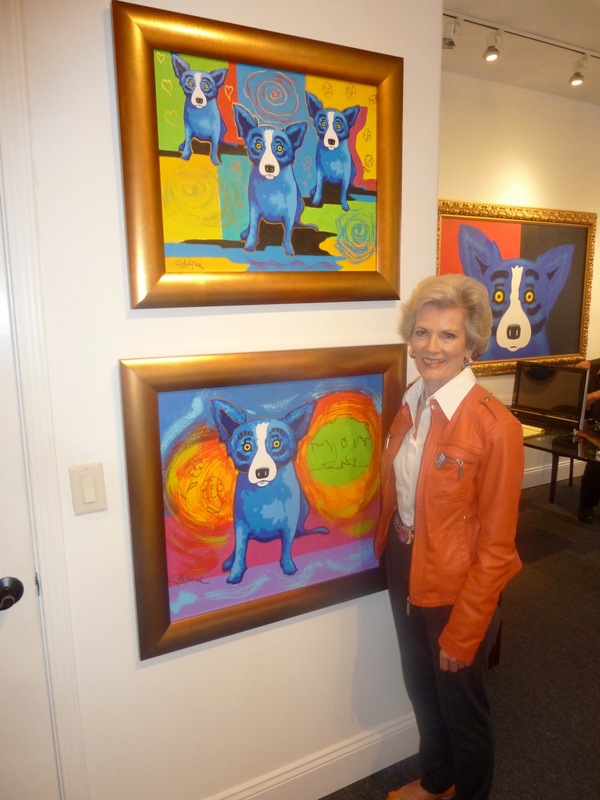 In fact, Jenny Johnson, who works today full time at Rodrigue Studio in Carmel, worked first in her family’s business, The Decoy, and later for the Lynn Lupetti Gallery, both originally on our block. Also during this time, Mary Threadgill came to work for the gallery. 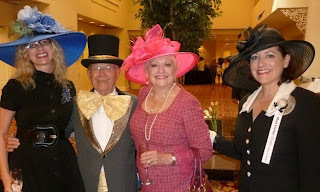 A Certified Gemologist, Mary and her late husband, Burney, were longtime Carmel residents who raised their family here while also treating me as their own. In Carmel I worked from the beginning with Sandra Crake, a Baton Rouge native by way of Arkansas and Texas, who remained in California until 2011, when she returned to Louisiana. 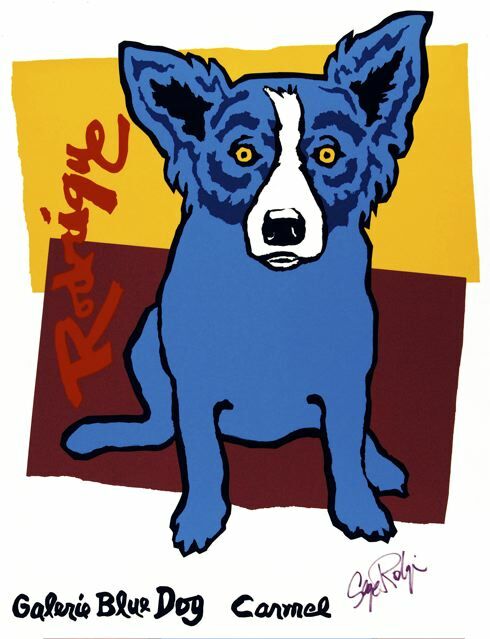 Today she works at Rodrigue Studio in New Orleans, embracing, even as she misses the quaint village and golden light of Carmel-by-the-Sea, the nostalgia that accompanies her southern roots and the closeness of family. In 1998 George Rodrigue became, once again, agent-free and owner of his galleries. A change in name accompanied the legalities, and Galerie Blue Dog became Rodrigue Studio. In 2009 he relocated his Carmel gallery to a location he eyed for years, abandoning the former doctor’s office for a larger and brighter exhibition space. Today I channel the early years as my ‘olden days,’ recalling our first clients, hand-written invoices, and daily trips to Carmel Camera Center. I rehung the gallery many late nights, imagining on the following morning, as I walked from Guadalupe to Dolores, that I encountered George’s art for the first time. If I didn’t stop, stunned, I pulled the paintings from the walls, grabbed the ladder and hammer, and started again. I recall with sentiment, but without longing, the heavy gallery typewriter, along with Sandra’s and my excitement over the new ‘roll’ fax machine and the way, as Sandra said, we “stood on our heads” on the gallery floor, finagling a 6-foot high roll of bubble wrap and assembling wooden crates. 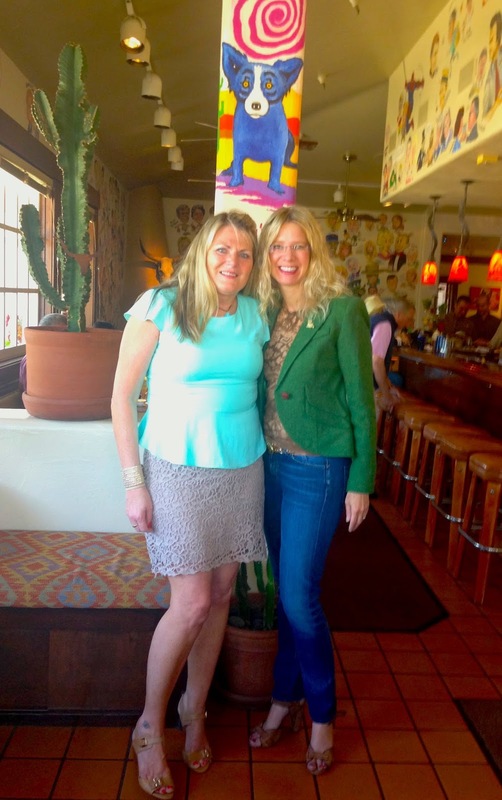 Throughout it all, we adhered to our self-imposed 1990s gallery fashion: short skirts, high heels, and big hair. George and I dated in Carmel between 1993 and 1997, when we married and returned to live in Louisiana. We’ve kept a home on the Monterey Peninsula ever since, visiting often over the years and returning this past spring, indefinitely. How could I ever in good conscience clamor for you to come back to the most difficult city in the hemisphere when you can live in a town straight out of a happy children's story? 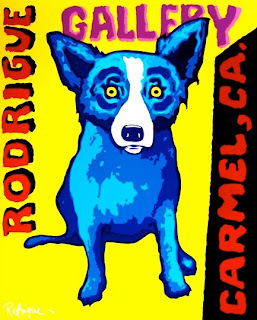 I purchased my first Blue Dog at that Carmel Gallery from Wendy herself and, along with my God Bless America, it remains one of my most treasured possessions. Monterey is my home town, actually Pacific Grove, and so it was nice to read about your daily walks and the fond memories that brought to me. I cannot wait to get back "home" and visit the new gallery. Great to hear from you, Diane- Many thanks for your purchases over the years--- and thank you especially for writing in. Your comments and memories enhance the story!